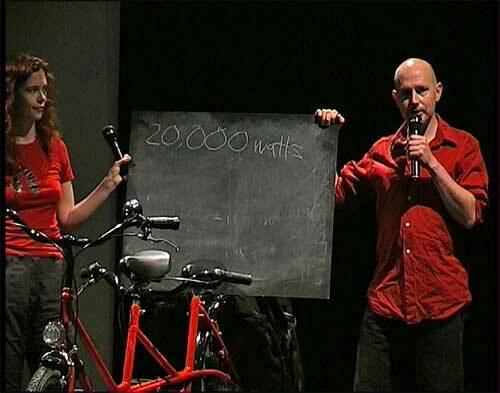 Wonderworld was a performance that used a bicycle tour on a tandem as its central metaphor and research material. Using the opportunity of a small residency at Schloß Bröllin in Mecklenburg Vorpommern, we decided to cycle the 130km distance through the countryside North of Berlin collecting video material and impressions that became the starting point of a devised performance we finally gave at the Podewil back in Berlin. The tandem, on long-term loan to us from Gob Squad, and used again by us on 'A Bicycle Made for You', attracted us as an artist-duo as being a metaphor for our relationship and how one has to work together to navigate through the known and unknown territory that the future holds. It is also somehow intrinsically funny and stops too much of the navel-gazing that such a metaphor could entail. In the course of the performance, we contracted the two-day bicycle ride into one hour and the 130km into the length of the studio space (the Probebühne at Podewil). We talked about our relationship, cycling, what it would take to power the performance itself with a bicycle and the good deeds that other cyclists do like picking up fallen bikes or making sure that kerbs are softened with planks of well-placed wood. 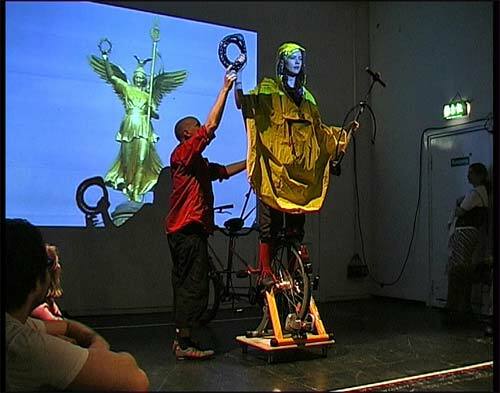 The performance ended with the personification of these good deeds in the form of a bike-angel which itself was based on theGoldelse at the top of the Siegessäule in Berlin.